R & DKUKDONG JEYEN CO., LTD.
Meeting the antifreeze standard of GM in 1975 after only two years of its establishment as start, obtaining the KS mark for the antifreeze/brake fluid, developing the antifreeze "Crown A-103" in 1987 and obtaining a joint patent for the aluminum radiator engine with KIST in 1989, Kukdong Jeyen has succeeded in development of innovative products. A-103, a masterpiece, which was jointly developed with KIST in 1987, obtained the international material patent in the United States and Germany for the first time in Korea and attained splendid achievement of replacing all-imported antifreezes that were used in domestic automobile manufacture’s all exporting vehicles with domestic manufactured antifreeze. This patent was recognized as one of Korea’s representative invention and exhibited at The Independence Hall of Korea. 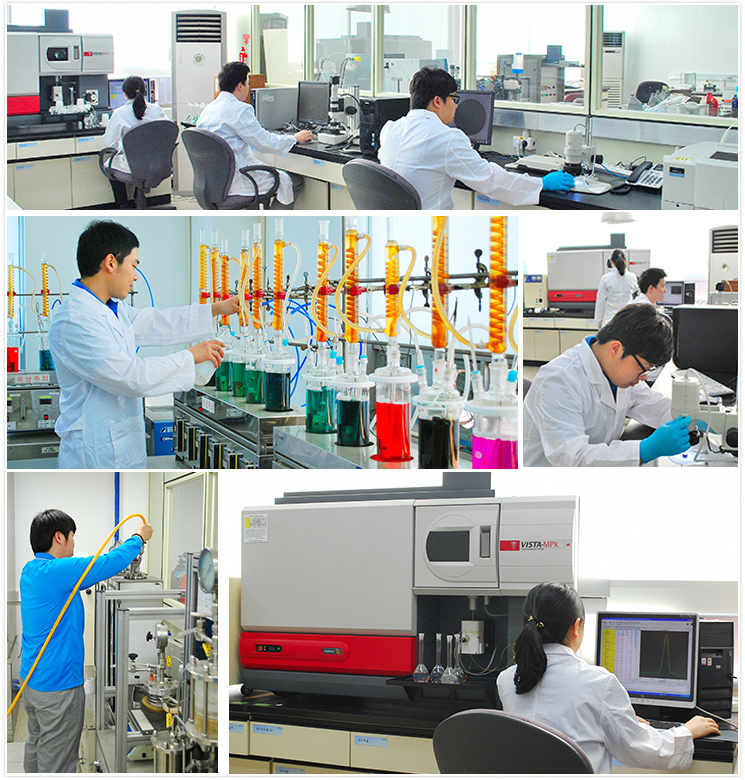 With the momentum of development of Crown A-103, Kukdong Jeyen developed Korea’s first five-year (100,000-km) change-free antifreeze in 1995 with the exclusive technology of the affiliated research center and obtained the KT mark from the Ministry of Science and Technology. Selected as Vision21 Leading Business, Venture Firm, Promising Small and Medium Business, and Technical Competitive Business since 1997, Kukdong Jeyen has accelerated on technical R & D, thus obtained ISO 9002 from the Korea Quality Certification Center in 1999, developed a heat transfer fluid for storage boilers in 2001 and an engine anti-rust agent in 2002. Furthermore, Kukdong Jeyen developed the 10-year (200,000-km) change-free antifreeze in December 2007. Recently, the national R & D project of developing an antifreezing coolant for fuel cell cooling systems with Hyundai Motor Company in 2008 came to a success in 2010 as first in Korea and now being applied to the hydrogen fuel cell vehicles manufactured by Hyundai Motor Company. 10.Developed an anti–hard-water antifreeze for Ssangyong Motor Company Co., Ltd.
03.Developed a five-year change-free antifreeze for KIA Motor Company Co., Ltd.